A study published in the journal Nature, and co-authored by LASP scientist Sascha Kempf, indicates that samples of water vapor and ice particles coming from Saturn’s icy moon Enceladus demonstrate evidence for a large, subterranean salt-water reservoir. The Cosmic Dust Analyzer (CDA) on board the NASA Cassini spacecraft measured the composition of plumes—emanating from fractures called tiger stripes—and found that ice grains close to the moon are salt rich, unlike those that make up the planet’s E Ring. “The study indicates that ‘salt-poor’ particles are being ejected from the underground ocean through cracks in the moon at a much higher speed than the larger, salt-rich particles,” said Kempf, Deputy Principal Investigator of the CDA instrument. The Cassini-Huygens mission to Saturn is a collaborative effort between NASA, the European Space Agency, and the Italian Space Agency. Launched in October 1997, the mission is currently on its second extended mission and its 12 instruments continue to provide valuable data from the Saturn system. In addition to LASP involvement with the CDA, LASP scientist Larry Esposito is the Principal Investigator for the Cassini Ultraviolet Imaging Spectrograph (UVIS), which was designed and built at LASP. During a 2010 flyby, the UVIS instrument obtained results that also support the presence of a subsurface ocean on Enceladus. Postberg, F., J. Schmidt, J. Hillier, S. Kempf, and R. Srama. 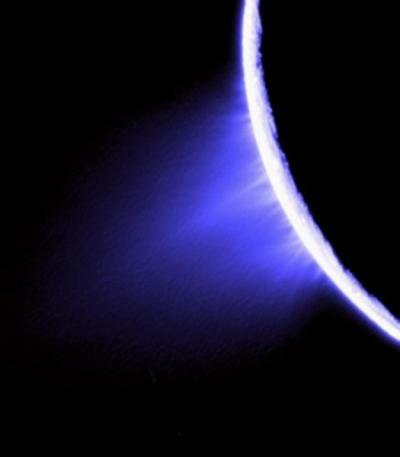 A salt-water reservoir as the source of a compositionally stratified plume on Enceladus. Nature advance online publication, 22 June 2011 (DOI 10.1038/nature10175).